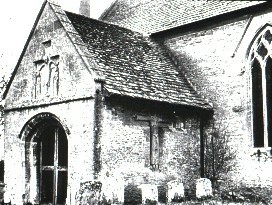 South porch of Langford Church. This has two Crucifixion scenes. The east wall of the south porch has the larger Crucifixion scene. The head of Christ is missing. He is wearing a long clerical garment with sleeves. The figure also has long sleeves. The second Crucifixion scene is in the gable of the south porch. It is much smaller and has a figure on either side of Christ both looking away. These have been identified as Mary and John. The figure of Christ is slightly distorted.